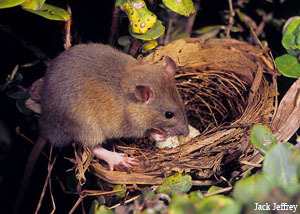 Predators such as feral cats, mongoose and rats eat ʻAlalā eggs and chicks. Learn more about how these predators affect ʻAlalā and other native plants and animals from the Conservation Council for Hawaiʻi. Get the Facts About Rats from the US Fish and Wildlife Service. Check out the American Bird Conservancy’s “Cats Indoors” campaign. Like other native forest birds, ‘Alalā can get sick from avian malaria carried by mosquitoes, as well as from toxoplasmosis carried by feral cats and rats. Pox virus, transmitted by mosquitoes or through contact, can cause debilitating lesions. 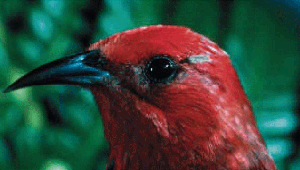 Learn the basics about avian malaria in Hawaiʻi by clicking here. Also, here’s a great article on avian malaria and it’s impact in Hawaiʻi. What is toxoplasmosis and how does it harm ʻAlalā? Click here to find out. Forests that ‘Alalā once called home have been changed by human activities like development, agriculture and ranching. 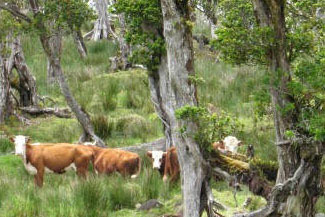 Cattle, sheep and pigs can munch and trample understory plants. Due to the loss of trees and understory shrubs, ‘Alalā have less food to eat and limited cover to hide from predators.